Rolling resistance is a term used to describe the resistance between the tire and the road surface, it is calculated that this counts for approximately 20% of a vehicle’s fuel consumption. The material it is made from can dramatically improve a vehicle’s fuel efficiency and therefore the EU labels now identify this through a classification system. For instance, a tire classed A is of greater quality than one classed F, and could potentially save up to 80 litres of fuel per year. The tread of a tire is designed to disperse surface water and provide necessary grip on the road, which is essential for handling and braking. The stopping distance of a vehicle is always affected by wet conditions due to the water held by the tread. 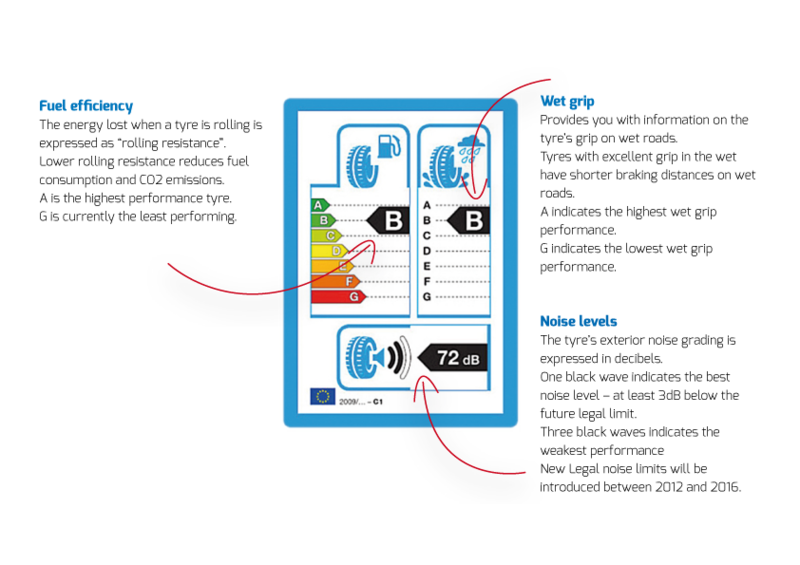 EU tire labelling allows consumers to see how well each tire performs when braking in the wet. Class A tires have a more responsive braking distance, in some cases up to 10 metres. The noise made from a rolling tire may seem like a trivial consideration but drivers who spend long periods of their day on the road often opt for anything that may contribute to a more comfortable driving experience.